sean1982 wrote: But who says the Max8 has to be exactly the same size as the current NG800? After all a slightly longer fuselage offers customers a lot more options then just high density seating? But the difference between the -800/-900ER or MAX8/MAX9 isn't that big at all (39,5m compared to 42,1m overall length). Why would you even consider adding length to the MAX8, bringing it even closer to the MAX9? The -800/MAX8 currently is the sweet spot of the narrowbody market (just like the A320neo). One LCC is not changing that. That 'slightly' bigger fuselage also brings something more than just 'slightly' extra costs when there is only one airline wanting to have those aircraft. Besides, RYR just wants to get more people in the same aircraft, they don't want a larger aircraft, otherwise they would order the MAX9. I was under the impression that the MAX9 was targeted as a replacement for the B757 which a lot of US airlines are relying on ... but those airframes are in the fall/winter of their lifespan. sean1982 wrote: I was under the impression that the MAX9 was targeted as a replacement for the B757 which a lot of US airlines are relying on ... but those airframes are in the fall/winter of their lifespan. The MAX9 offers a high-density configuration of 215 seats or 180 in a regular 2-class configuration and this with a range of about 6,600 km. So less passengers and less range. But it's enough to replace many of the 757-missions. The A321neo is slightly better for the longer missions. But neither offer a real 757 replacement (Boeing has a project running that looks at potential aircraft (versions) to be a real 757 replacement, but it is far from sure such an aircraft will ever exist, especially since they have their hands full with the current 3 MAX versions, the later two 787 versions and the two new 777 versions. I don't know howlong ago the rule of 1 F/A per 50 pax was established; if its an already old rule, why is Boeing (and maybe Airbus) proposing 215, 180 or 189 pax configurations instead of optimizing them? While Boeing is working on the 737MAX development, engineers reached improved fuel-efficiency. Boeing previously promised 13% better fuel-efficiency over current generation aircraft, they can now promise 14%. This improvement was achieved thanks to a tighter integration of the engine to the wing and better aerodynamics in the new winglet design. RoMax wrote: While Boeing is working on the 737MAX development, engineers reached improved fuel-efficiency. Boeing previously promised 13% better fuel-efficiency over current generation aircraft, they can now promise 14%. This improvement was achieved thanks to a tighter integration of the engine to the wing and better aerodynamics in the new winglet design. Boeing is pleased that Air Canada announced an agreement today that includes commitments, options and rights to purchase up to 109 Boeing 737 MAXs. When finalized, the firm order for 61 737 MAX 8s and MAX 9s is expected to be worth $6.5 billion at list prices and will be posted to the Boeing Orders & Deliveries website. "We're honored that Air Canada chose Boeing to lead its fleet renewal plan," said Brad McMullen, vice president of North America Sales, Boeing Commercial Airplanes. "We know the 737 MAX will provide the airline and its customers with an experience that can't be matched." Boeing started the year with the finalization of a big Dubai Air Show order. FlyDubai firmed its order for 75 MAX 8 aircraft and another 11 NG -800's. They also have an additional 25 purchase rights. Air Algérie also announced that it will order another 8 737-800's. Previously they announced an order/commitment for 3 (?) extra Airbus A330 aircraft and they will also sign a contract for 3 more ATR72 aircraft. RoMax wrote: Boeing started the year with the finalization of a big Dubai Air Show order. FlyDubai firmed its order for 75 MAX 8 aircraft and another 11 NG -800's. They also have an additional 25 purchase rights. The order was booked at the end of 2013 already based on Boeing's latest orders and deliveries oversight. GECAS announced an order for 20 737 MAX8's (they now have 95 MAX aircraft on order) and another 20 of the NG -800. But this order was also already booked in 2013 as an order for an unidentified customer. So far I have only seen the two small orders actually firmed in 2014 from Alaska Airlines and Air Algérie. While discussing yesterday with Kenny Jacobs, Chief Marketing Officer at Ryanair, he told me that he was lees than enthusiastic about the 737 MAX that Ryanair has ordered. The MAX version weighs 12 tonnes more than the NG version for the same number of passengers (mainly due to heavier engines and a stronger wing to support them). But airport landing fees and fly-over fees in Europe are not based on the number of passengers, but on the weight of the aircraft. Hence, the fuel savings obtained with the 737 MAX as compared to the 737 NG will be neutralised by higher airport and fly-over fees. Has there been an official release that they ordered MAX's? Only heard rumors about it and nothing official yet. You're right: it's only an intention. What a trash-talk by a CMO. The MAX will only be 3t heavier in empty mass and 2t heavier in MTOM. They can always derate MTOM (on paper) to pay less taxes, as they currently do for a lot of 737NGs. It will still be a bit heavier than the NG, but not by 12t, by far. If all gains are cancelled out by the higher MTOM, why do other airlines order it in large quantities then? Yeah, even for a "metrically-challenged" person +12T is nonsense. Boeing Airplanes is now offering a new minor model of the 737 MAX. It's the 200-seat MAX 8. By adding the same mid-exit door as on the MAX 9, this variant of the MAX 8 can accommodate the 11 extra seats as compared to the regular MAX 8. Boeing claims that the 200-seat MAX 8 (a rather confusing name) is on track to deliver a 20% more fuel efficient product than today’s 737 NG. Methinks that there will be not much legroom in such a plane. A Ryanair order to follow? A reaction on the plans to raise the A320’s accommodation to 189 seats. And the plans for A321neo’s to 240 passengers? The move effectively is a response to the recent capacity increase of the Airbus A320neo (from 180 to 189 seats). Today’s announcement once again gives Boeing the edge, essentially preserving the lead it had previously maintained. The high density MAX 8 version also begs questions of the future of the MAX 9 (currently 204 seats maximum). The MAX 8 with 200 seats has obviously better economics than the MAX 9 with 204 (which also requires one more flight attendant). A move to expand the MAX 9 would not be unexpected, particularly given Airbus’ recent extension of the A321neo to 240 people. 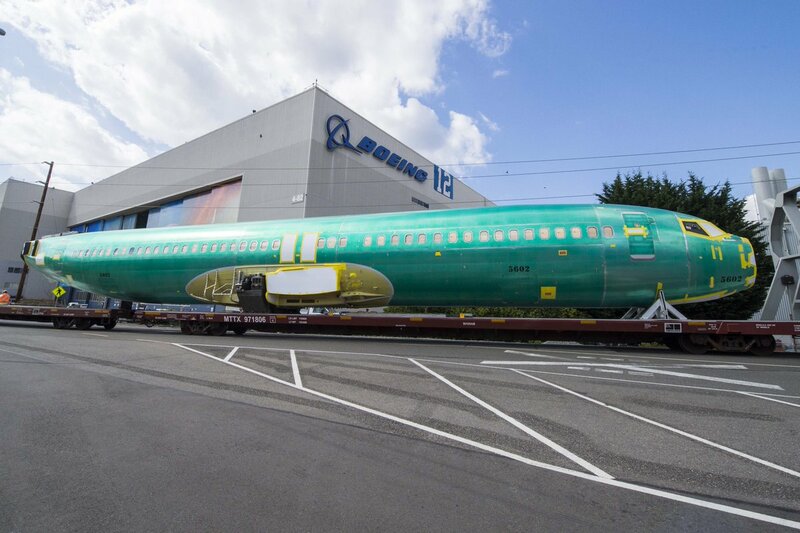 The first 737 MAX fuselage (manufactured by Spirit Aerosystems in Wichita) just arrived at the Renton factory of Boeing on a train car. RoMax wrote: Xiamen Airlines also signed for 40 Boeing 737's (type isn't mentioned) for delivery between 2016 and 2019.